Northwest Colorado has built a reputation for trophy elks, but hunters are discovering that this area also offers great opportunities for deer as well. The population growth has allowed the Division of Wildlife to be more relaxed with deer licenses. At the same time, the number of elk licenses in Northwest Colorado is decreasing as the herds get closer to the objectives set by the Division of Wildlife. 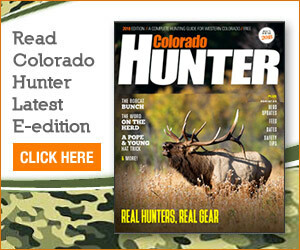 Hampton said the deer and elk populations in Colorado are doing well, and hunters can now enjoy the best of both worlds. While many of the hunters who come to Colorado will be looking for trophy elk, Hampton believes that deer offers hunters a choice. Elk tend to spend their winters at higher elevations where they can find dark timber, and an average bull elk weighs between 450 and 900 pounds. The autumn weather tends to push them out of hiding into areas where they are more accessible, but Hampton said in most cases it’s still more difficult than tracking down a deer. At half the size, deer are less intimidating and easier to handle in the field. Deer also tend to hang out in areas that are more accessible and require less work on the hunter’s part. Hampton said Northwest Colorado, in particular the area around Meeker, is home to one of the largest deer populations in the state. Hampton said the high mountain terrain and climate of the Steamboat Springs area tends to favor elk hunting. Elk can stay higher later into the fall and don’t mind the early season storms that can dump 12 to 18 inches of snow in the high country. Deer prefer the mountain valleys and normally move lower earlier in the season to avoid early snow. But even around Routt County, several areas traditionally have been good for deer hunting: Routt County east to Craig, near Walden and in South Routt County.